In stock -This product will ship today if ordered within the next 8 hours and 34 minutes. A Vogel Symphytum Creme can be used to protect tired and exposed skin especially on the face and hands. This comfrey cream is made from freshly harvested, organically grown comfrey herb. Use as day and night cream, as often as needed. Contains peanut oil, do not use if you are allergic to nuts. Do not take Comfrey internally unless under the supervision of a healthcare practitioner. Consult a healthcare practitioner if pregnant. 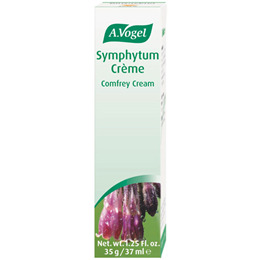 Below are reviews of A Vogel Symphytum Creme Comfrey Cream - 35g by bodykind customers. If you have tried this product we'd love to hear what you think so please leave a review. My daughter has been suffering with molluscum contagiosium and nothing was working, until we heard about this cream and it's like a miracle. It takes a few weeks to start noticing a change, but keep at it and you will see the spots dry up, scab over and eventually burst and go. I wish i had found this cream sooner. Excellent cream for dry skin. I use it day and night. Ths is a smashing cream.Its nourishing, non greasy, soaks in well as I have very dry skin but leaves a nice sheen and has no nasties in it. I'm a big A Vogel fan and found this after reading his nature doctor book saying that no dressing table should be without a borage or comfrey cream or oil as it reduced wrinkles and signs of ageing. As a gardener i know how nourishing comfrey or symphytum is to the land and so it is the same for our faces.No scent and works well at a snip of most other moisturisers prices. ONLY COMPLAINT... please hear this at A Vogel... Could you supply it in a bigger tube or pot as this is too small a quantity and would reduce packaging if in a larger container.